The Clary Sage is growing very well in the Great Wall Garden. The leaves are wonderfully large and a soft gray-green. A biennial herb, it was started from seed last year and will bloom this year. Some fresh leaves will be infused in oils for Just for a while . . . It's all about You! massage oil and lotion. 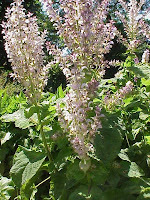 The subtle characteristics of clary sage are said to benefit a number of issues presented by some clients. For more information see below. In western herbal medicine, clary sage is considered valuable for calming and soothing emotions, relieving digestive upsets, easing female hormonal problems, and as a restorative for fatigue, stress and insomnia. Used topically as an essential oil for massage, clary sage is helpful in easing varicose veins.